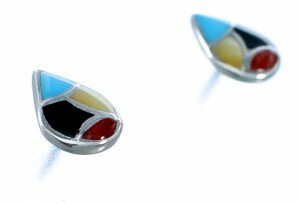 Sterling Silver, real Turquoise, Coral, Jet, and Yellow Mother of Pearl. 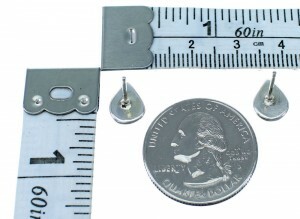 Post earrings measure approximately 3/8" long and 1/4" at widest point. 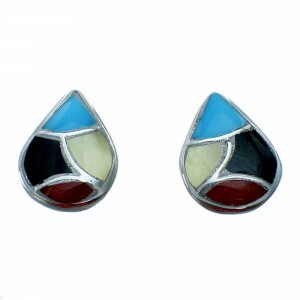 This magnificent and traditional pair of earrings represents the finest of Zuni craftsmanship! This piece of Native American jewelry is Zuni hand crafted by artist Thurza Leekya, out of genuine sterling silver, along with real multicolor inlay. The inlay consists of: Turquoise, Coral, Jet, and Yellow Mother of Pearl. The inlay is carefully set, creating a lovely tear drop shape, while thin silver lines accent the earrings for an outstanding finish.